The actions are optional, and a player can perform them at his/her discretion during his/her turn. The actions can be performed at the beginning or the end of a phases, but never during it. Play an Event card or - alternatively - begin to activate an Artefact. When an Event is played, it begins functioning and remains active until the end of the player's turn. Alternatively, the player can begin to activate an Artefact from his hand by playing the chosen Artefact, which will not be functional until the end of the card replenishment phase of the same player's turn (basically it begins to be functional during the next turn, when the Preparation phase begins). Use active Artefacts. The player can use an active Artefact. To use it, the player simply states which one will be used, he/she applies the effects and then discards the card by putting it in the discard pile. During his/her turn, a player may use as many Artefacts as he/she wants as long as they have been activated. There is no limit to the number of active Artefacts that a character can have. Use your Ability. During a turn, a player can use his/her Ability as long as the conditions are in place to do so. How the Abilities work is on the character sheet and the effects apply immediately. Each Ability can be used once per turn. All Abilities are used only at the beginning or at the end of a Phase. Using your Advantage. Using the Advantage is similar to using the Ability. 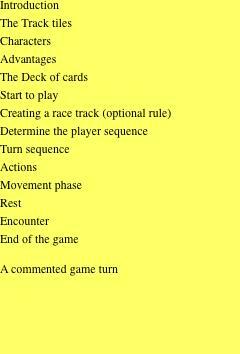 During a turn, a player can use the Advantage that he/she has as long as the conditions are in place to do so. An explanation of how Advantages work is on the card and the effects apply immediately. Just as for the Abilities, the Advantages can be used once per turn and only at the beginning or the end of a Phase.